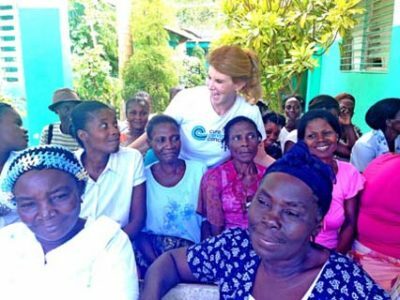 PATRICIA GORDON WITH PATIENTS at the CureCervicalCancer clinic in Borgne, Haiti where she will be establishing a new clinic in that same region in six weeks. That “something” led to the birth of CureCervicalCancer, (CCC), under which she has set up clinics in third world countries to provide permanent cervical cancer screening and treatment centers. Over the past two and one-half years, the Hancock Park resident has established 16 permanent and sustainable programs in five countries on four continents. The overwhelming success of CCC has prompted her to retire from her medical practice to guide CCC into the future. A slim, attractive strawberry blonde with non-stop energy, she looks more like a lady-who-lunches than the dynamo that she is. Dr. Gordon said cervical cancer, which causes nearly half a million deaths per year, is the leading cause of cancer-related deaths in women in third world countries, with 80 percent of all cervical cancer cases occurring in developing countries. This epidemic is nearly 100% preventable with her simple yet elegant technique. It was while she decided to serve as a volunteer with a medical mission in Senegal that her desire to bring screening and treatment to women in remote places was ignited. Since then, she has been in the slums of Nairobi, avoided druglords in the Northern region of Guatemala and been held 15 hours in an airport while officials decided on her authenticity. The method for screening is the “See and Treat” program. she brings supplies in suitcases, called a Clinic in a Box, containing cryotherapy machines that freeze the lesions, probes, flashlights, swabs, vaginal specula and hot plates (to sterilize cryotherapy tips). The equipment enables her to set up clinics where thousands of women are screened and treated for the potentially terminal disease. To date, CCC has examined over 10,000 women and treated more than 950 for pre-cancerous lesions. The clinics are located in Haiti, Guatemala, Vietnam, Kenya and Ethiopia, with 11 more clinics coming by the end of this year—26 programs in total! To make sure that the clinics are sustainable, a permanent examination room is set up; local staff are trained and assigned to the clinic and staff makes monthly reports to CCC on the number of women examined and treated. A recent report from a clinic in Vietnam is indicative of the work being done. The clinic nurses, trained in the See and Treat method, saw 900 patients, identified 120 positive patients, and performed 140 cryotherapy procedures in just one month! Dr. Gordon has to deal with each nation’s officials to get permission from local authorities and ministers of health in the five countries to establish the clinics. The non-profit agency has established partnerships with the International Medical Corps, Columbia University Millennium Cities Initiative, Haiti Outreach, Para Cirugia and Africa Mission Services of USA. There is an on-going relationship with the UCLA GYN department, which sends a gynecologist with CCC on every program. Donors who give $10,000 and up have naming rights, often times choosing to memorialize their family members. With a permanent metal placard hanging over the clinic door, these clinics stand in perpetuity as a beacon of hope for thousands of women, granting them access to life-saving healthcare on an ongoing basis. “I feel blessed to have had such an immense outpouring of support from local Hancock park residents. Several clinics have been named in honor of local families who have been with me from day one to see this non-profit flourish,” she said. Dr. Gordon will host a Women in Leadership lunch at the Ebell of Los Angeles, 743 S. Lucerne Blvd., on Mon., Nov. 3 at 11:30 a.m. Tickets for “From Beverly Hills Oncologist to International Women’s Healthcare Advocate” can be purchased at ebelleventickets.com. For more information, go to CureCervicalCancer.org.